With weather patterns thrown into bone-chilling disarray by a collapsing polar vortex, the topic of summer camp offers a pleasing reminder that conditions will eventually and inevitably moderate. Cybersecurity summer camps have proliferated in the last few years, and we are surely still at the beginning of the growth curve. Even now, the roster of camps runs the gamut of learning goals, experience levels, cost, and timing. In a field like cybersecurity where the pathways into a career are so varied, summer camp can serve the needs and interests of college-bound and work-bound high school students alike. An essay recounting reflections and accomplishments related to cybersecurity can nicely fill out a STEM-oriented college application packet. Success in a cybersecurity camp can also launch a more vocationally focused student on a journey towards certification or an associate’s degree in the field and almost-sure, gainful employment. Camps exist to serve all these interests, and they have become widespread enough that most people are likely to live close enough to universities or training academies to find an option that suits. A bonus feature of cybersecurity camps can often be the low cost; acute workforce needs in the field mean government and industry funding is often available to make camps nearly or actually free, especially for students with some demonstrated experience or aptitude. The number of GenCyber camps has grown from eight to over 150 in just five years. The camps serve both students and teachers in an effort to increase the numbers of students interested in the field as well as improve teaching methods. The granddaddy of cybersecurity camps is GenCyber, a partnership of the National Security Agency and the National Science Foundation. Started five years ago at eight prototype sites, it has grown to more than 150 camp sites, as of last summer. The program offers comprehensive, learner-appropriate training in cybersecurity to all K-12 levels as well as teachers. Offered at college campuses, it aims to increase the numbers of students considering cybersecurity studies, to teach campers about online safety, and to improve teaching methods for delivering cybersecurity content. Oh, and it’s free, thanks to government funding. Except that – bummer alert – awards for 2019 program sites are currently on hold, pending the (sub-awesome) federal government shutdown. Other examples of comprehensive camps operate at places as varied as Northern Virginia Community College, the Hawaii Office of Homeland Security, and Capitol Technology University. Many GenCyber camps focus also on redressing the gender imbalance in cybersecurity. The data on women in the field vary a lot, according to how surveys count jobs “in” the field and when responses were collected. The worldwide range is 11 to 20 percent. One trend seems to be a general increase, welcome not least because diversity is a strategic asset in developing cybersecurity solutions. Attacks come, by definition, from people who see the world differently from those of us who do not engage in cybercrime. Stacking the ranks of cybersecurity professionals with as many different perspectives as possible is a hedge against attacks we did not see coming our way. The Maryland Cybersecurity Center partners with various groups, including the National Cryptologic Museum, to offer multiple programs for middle and high school girls. The Tandon School of Engineering at New York University has a long-running, girls-only camp called CS4CS. It started out as a GenCyber camp but has transitioned to an independently funded operation. Three weeks long and free, the camp presumes girls have no prior experience in the field, just interest and an ability to make it to campus. The Cybersecurity Research Lab at Brigham Young University runs a week-long program for high school girls, also free thanks to funding from Microsoft and Facebook. The BYU Cybersecurity Research Lab runs a popular camp for girls. Started in 2015, it has proven effective at launching alumnae into the field. Cybersecurity camps come in many other flavors, as well. Stressing fundamental concepts and an introduction to cybersecurity principles, Embry-Riddle Aeronautical University and Syracuse University make general appeals to potential campers. Workforce training is paramount at the US Cyber Challenge, Ferris State’s Business School-based camp, and NW Cyber Camp, which runs at four sites in Oregon. US Cyber Challenge even requires candidates to score well on an online test before applying for admittance. Also notable for a workforce focus is the NSF-funded Cyber Security Education Coalition, an eight-state effort with multiple academic, government, and industry stakeholders. Rose State College in Oklahoma, for example, is a coalition member, offering a camp for high school teachers and students. Some programs more directly point students to college studies in cybersecurity, like the National Student Leadership Conference partnership with American University and the one at Champlain College. A vocational focus characterizes the programs at Penn State, Berks, and Georgia Southern Center for Applied Cyber Education. Students already familiar with networking, operating systems, and coding will do best at camps like these. This collection of cybersecurity camps illustrates, rather than exhausts, the opportunities available to interested students. From beginners to the minimally aware to the already-hacking, the universe of cybersecurity camps has something for all students. And increasingly, that something is likely to be nearby and affordable. The Google will lead you quickly to opportunities in your area. If you want to help a high school student you know think about cybersecurity as a topic for summer camp and further learning, you could do worse than start with our Cybersecurity Career Guide. It offers an engaging, wide-ranging overview of study and work options in the field. Have cybersecurity camps popped up on your radar screen for summer activities yet? Heard of any interesting approaches? Let us know what your experience has been. And we appreciate it every time you share with interested colleagues or friends. 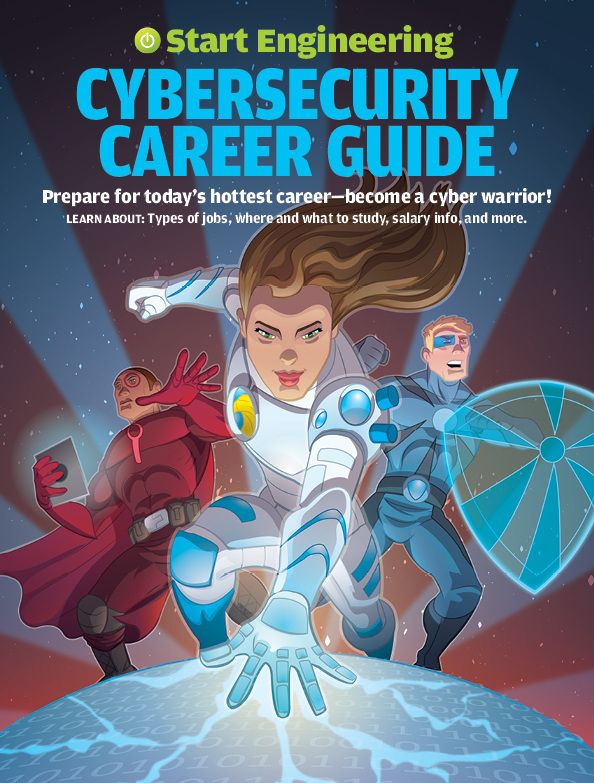 Our new Cybersecurity Career Guide shows middle and high schoolers what cybersecurity is all about and how they can find the career in the field that’s right for them. Now with a Student Workbook for classroom or afterschool use! To showcase STEM career options, pair our cybersecurity books with the 2nd edition of our Start Engineering Career Guide. We’ve also got appealing, fun engineering posters and engaging books for PreK-2 and K-5.